Sounds too good to be true...but it is! 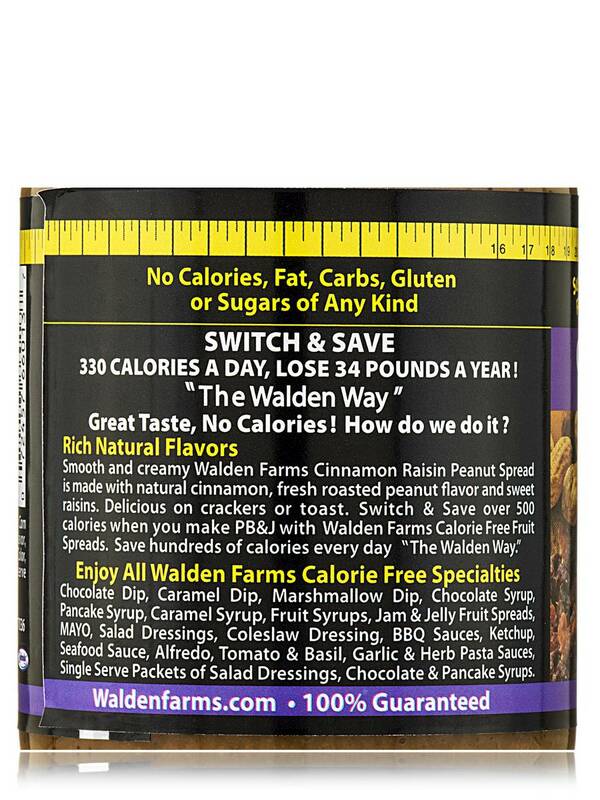 Introducing New Walden Farms Calorie Free Whipped Peanut Spreads made "The Walden Way." CINNAMON RAISIN PEANUT SPREAD with Natural Cinnamon and Sweet Raisins. Delicious on crackers or toast. 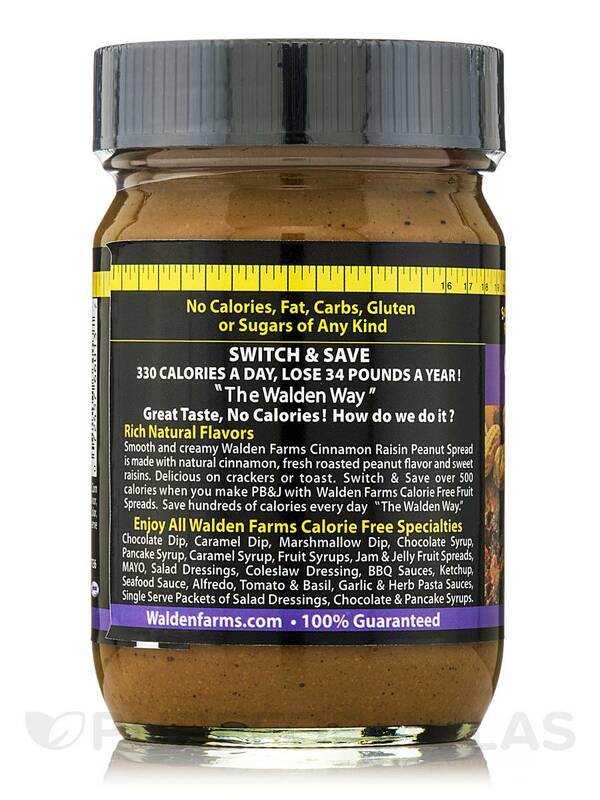 When making a PB&J switch from other brands of Peanut Butter loaded with sugar and almost 200 calories in just two level tablespoons to new Walden Farms Whipped Peanut Spreads and save over 600 calories when made with Walden Farms Calorie Free Fruit Spreads‚ "The Walden Way." Ingredients: Purified water‚ vegetable fiber‚ sea salt‚ corn starch‚ xanthan gum‚ natural roasted peanut flavor‚ natural peanut extract‚ chopped raisins‚ caramel color‚ lactic acid‚ cinnamon‚ sodium benzoate (to preserve freshness) sucralose‚ FD & C yellow #5‚ #6. Ordered Cinnamon Raisin Peanut Spread Jar by Walden Farms and was excited to try it but OMG - when I first smelled it, I thought uh oh, I have wasted my money. When I tasted it, that thought was confirmed. This is probably some of the most awful stuff I have ever put in my mouth. It would make a good yucky flavor for Jelly Belly's Bean boozled game. Don't buy it. If I had been able to give it a zero star rating, that is what it would have received. I found nothing except the name of the product to be something I liked. 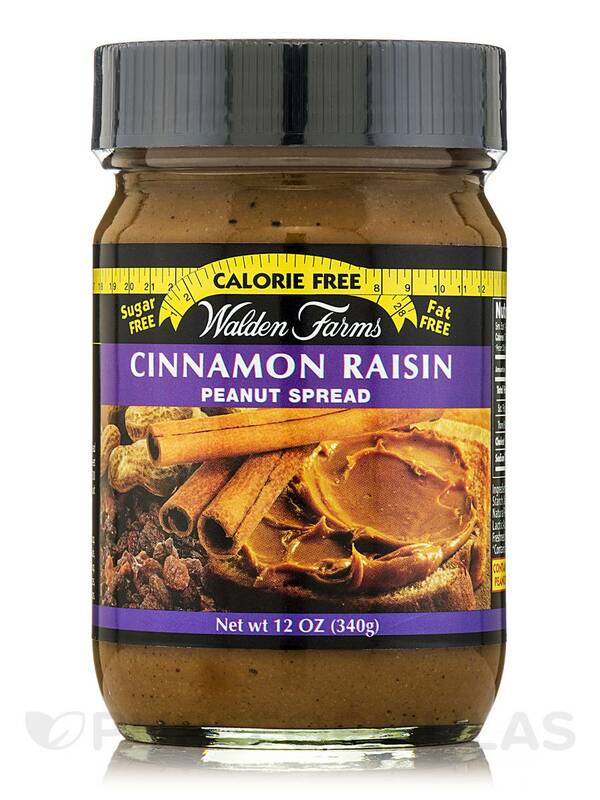 Cinnamon Raisin Peanut Spread Jar by Walden Farms was the worse tasting stuff I ever put in my mouth. Almost gagged me. Does not taste like peanut butter at all. 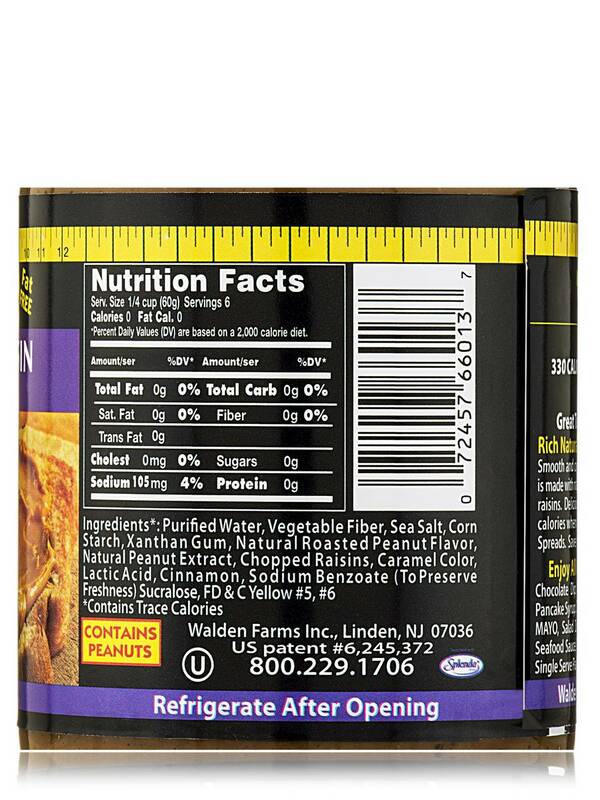 Cinnamon Raisin Peanut Spread by Walden Farms is a terrible product it tasted horrible. Horrible taste, couldn't get myself to swallow. Never thought it was possible for peanut butter to taste so horrible. Sounded good in theory, but I find it hard to eat Cinnamon Raisin Peanut Spread by Walden Farms. I can't like it no matter how hard I try. 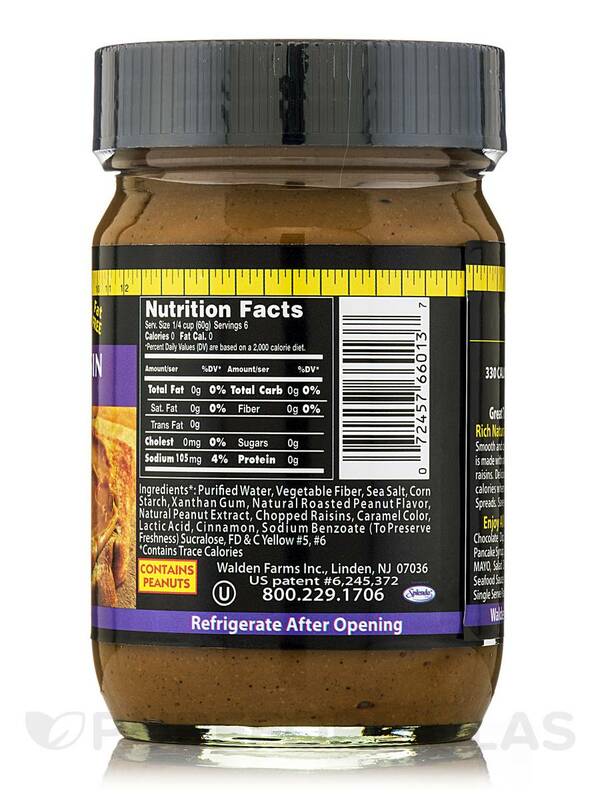 I love it, I eat Cinnamon Raisin Peanut Spread by Walden Farms every morning. The texture is a little weird. We loved the idea but not the taste.